The Conservatives today responded to allegations of partisan use of ministerial resources by rather weakly pointing out Liberal MPs who have used party logos in connection with their parliamentary work. I’m not sure if that’s the same thing Citizenship and Immigration Minister Jason Kenney is accused of, but close enough for horseshoes or hand-grenades. Tonight, I took a look at some of the local MPs in Ottawa to see what they had on their websites, party logo-wise, and noticed that Nepean-Carleton MP Pierre Poilievre has a modest little Conservative logo on his. Only Mrs. Grundy would take issue with that. Then I noticed the banner graphic with what I first assumed were Poilievre’s grateful constituents, huddled behind him and swaddled in a Canadian flag. There’s a nice looking Asian family, a female doctor of indeterminate ethnic origin assisting an elderly woman, and a mother-daughter-grandmother three shot. I smelled stock photo(s). A quick search online turned up a stock shot of the doctor and the older woman. It was taken by Lisa F. Young, a photographer in Clearwater, Florida. 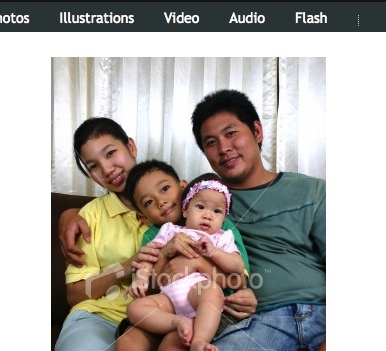 The doctor-patient picture is sold on numerous stock photo websites, including one run by the photographer herself. In the graphic on Poilievre’s site, it appears the women’s skin tones have been lightened up slightly. Now, I know these websites get thrown together in a hurry and on a budget. But Poilievre’s riding includes Barrhaven, a bedroom community that is home to a growing and vibrant community of new Canadians. You’d think Poilievre could have gotten a few of them to pose for a photo on his website. P.S. : I couldn’t find the other people in the banner in any stock photo databases, but I didn’t look that hard. I challenge readers to find them. Of course, they might be real people and even real constituents. If you recognize them, let me know. 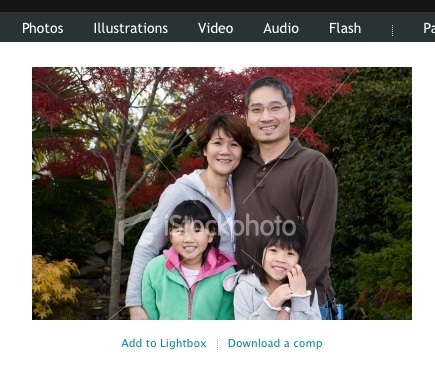 UPDATE: Props to my tweep Tricia Wood (@pkbwood), who found the smiling Asian family within ten minutes of this post. It looks like this shot was taken by Quavondo, a single-namer from Portland, Oregon (on Twitter as @quavondo). Poilievre could have livened up his site even more had he dug deeper into the Quavondo body of work. 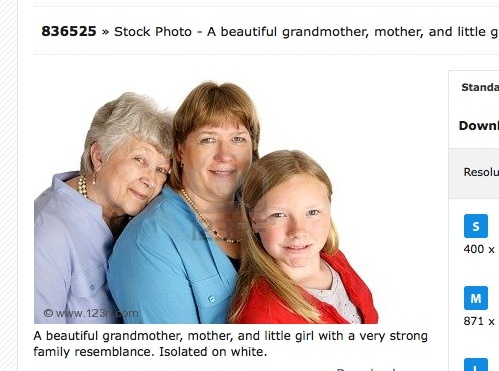 FURTHER UPDATE: Thanks to tweep Amy (@Tethered2Home) for locating the final stock picture of the mom, daughter and granny. It was also taken by Lisa Young of Clearwater, Florida. Yay, crowdsourcing! So, it looks like not one of the people wrapped in the Canadian flag in the banner images is a) Canadian, or b) a constituent of Nepean-Carleton. FURTHER, FURTHER UPDATE: Ottawa South Liberal MP David McGuinty has also found some stock photo ethnic people for the banner on his website. Credit again to @pkbwood for tracking it down. It looks like the picture next to it might also be stock. The shot of the family in the McGuinty banner was taken by Pathathai Chungyam, a photog in Thailand, so these “constituents” are even further away that Poilievre’s. 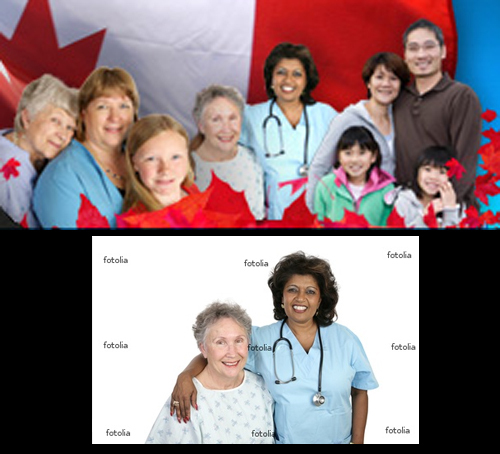 UPDATE v.4: Forward me any other examples of MPs using stock photos in place of constituents. Found Grandma, Ma, and Kid. Shutter stock has quite a few of this trio. Have a decent camera, not a cellphone camera. You need to know how to take a decent picture, which is a skill not everyone has. You need proper lighting, easier said than done inside. You also need to get signed release forms from the people in the pictures allowing their likenesses to be used. When that is all said and done, you can then start using those pictures in an ad. Doing all that could take a week, when getting stock images takes a few minutes – and it is all done for you. Yeah it may make for a better sound bite if you can say that you are using photos of your constituents, but is that a reasonable use of your time? I’d rather they save the time and just get it done.